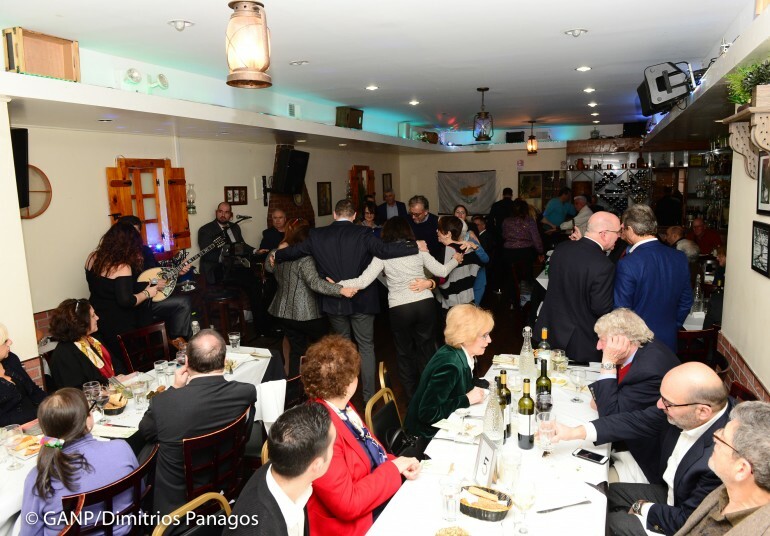 Members of New York’s Cypriot and Jewish communities organized a cultural celebration with their traditional food, wines, dancing and music at the Pancyprian Center on January 15. 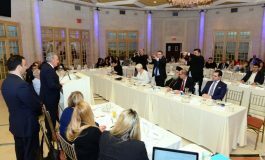 The event was held jointly by the Federation of American Cypriot Organizations (FCAO), PSEKA, the Cyprus-US Chamber of Commerce, Hellenic American Leadership Council (HALC), AJC Westchester/Fairfield under the auspices of the Consulate General of Cyprus in New York and the Israeli Consulate General in New York. 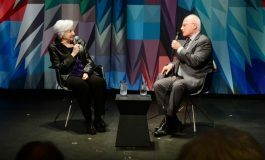 This was the first cultural event organized among the Cypriot and Jewish organizations of New York with the aim to promote the cultural cooperation among the two communities. 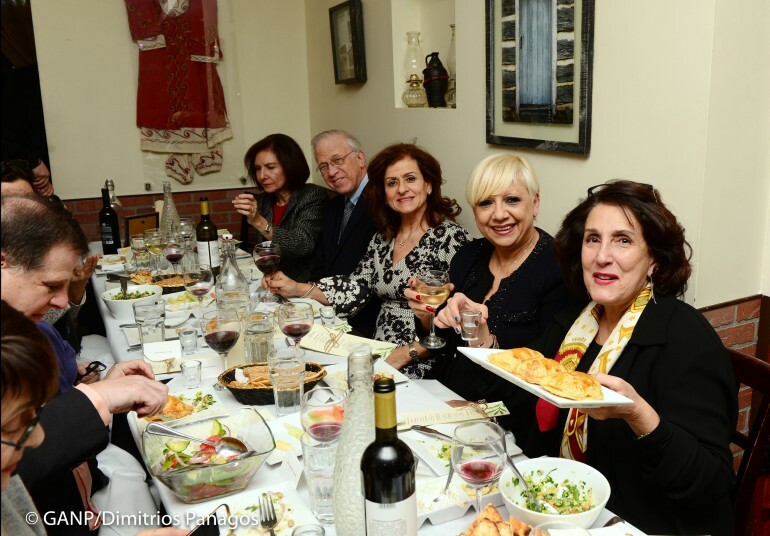 More than 70 members of the Jewish and Greek Cypriot organizations attended the event. Mona Abramson, Chair for the Cyprus Diplomatic Outreach Team for Westchester/Fairfield, spoke warmly about the Cypriot community and the relations with the Cypriot diplomats in the United States. Ms. Abramson thanked Cyprus for its friendship with Israel, stressing that the Jews would always remember the hospitality of the Cypriots towards the Jewish refugees who were trying to reach Palestine and were forced by the British to stay in Cyprus from 1946-1949. 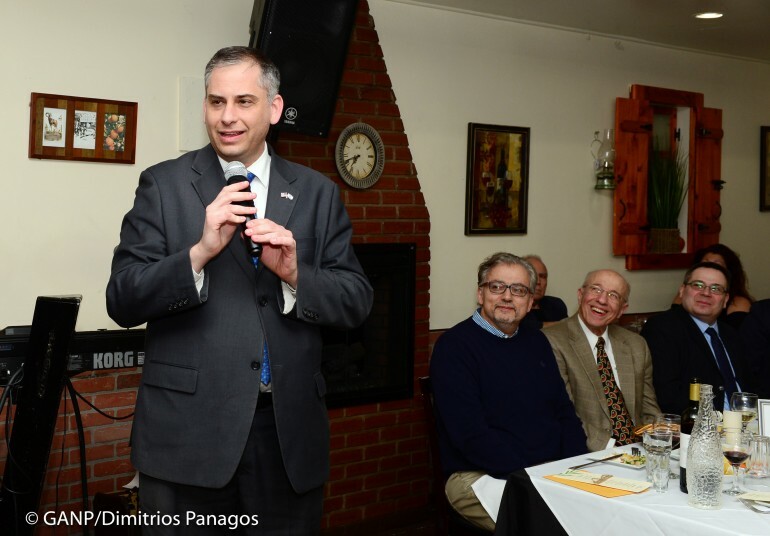 The Deputy Consul General of Israel in New York, Israeli Nitzan, referred to the importance of his country’s strategic relationship with Cyprus and Greece. “These days, we had several high level sessions between our prime ministers and our presidents. In recent years our relationship has gained incredible scope, depth, and determination, expanding beyond energy and covering the strategic situation and security in the region, ” he said. He also thanked the Consul General of Cyprus in New York, Alexis Phedonos Vadet for exploring the idea of such a gathering between the respective communities, during the regular meetings of the Consul Generals of Israel, Cyprus and Greece. 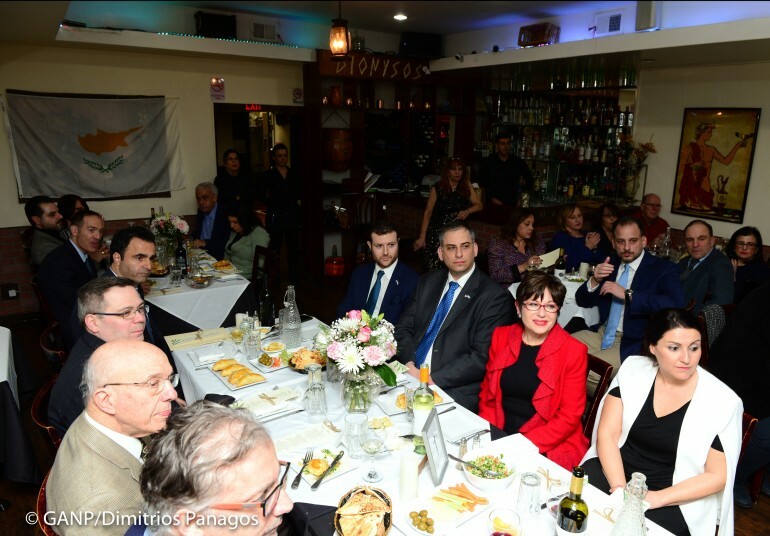 The Cypriot Consul General said he thought the close relationship between the three governments should be reflected accordingly in the respective communities in New York. 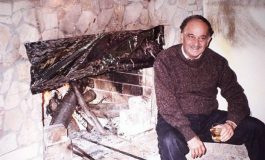 Recalling the progress in the Cypriot-Israel relations, he said they moved from health and tourism to the cooperation in battling wildfires in both countries and then to energy and security. The President of FCAO, Kyriacos Papastylianou welcomed the guests and spoke on the importance to preserve and promote our rich culture and history. Greetings were also made by the the President of the Cyprus-US Chamber of Commerce Nicos Nicolaou and the Senior Fellow for HALC Nicholas Katsimpras. 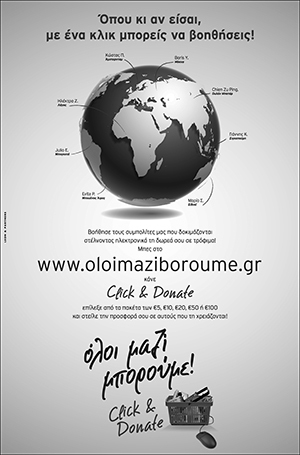 Tribute was paid to the Founder of HALC Nikos Mouyiaris who passed away recently. A statement of FCAO says, the cultivation of the relationship between the two communities commenced two years ago by the President of FCAO, Kyriacos Papastylianou with the idea of cultural cooperation among the two communities. “This is not the first time the two communities have come together. Our people have interacted with each other through the centuries. There is a strong alliance among the governments of Cyprus and Israel on the political, energy and environmental sectors, but it is through culture, theater, arts, dancing, education that the people of the countries will come together. 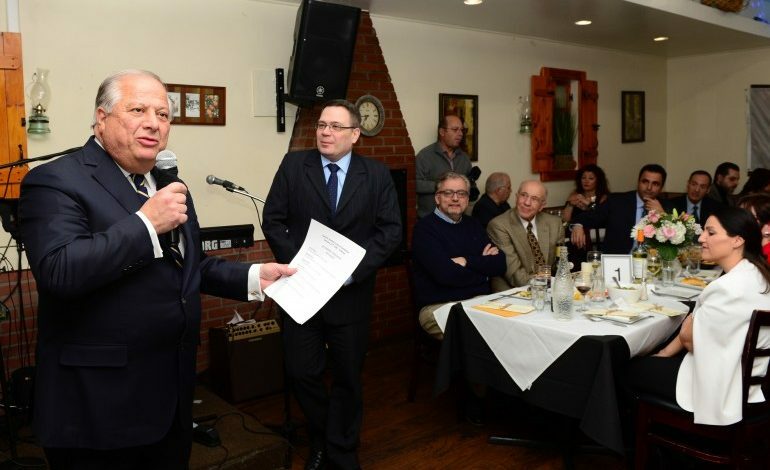 The Cypriot/Jewish Cultural Celebration at the Pancyprian Center signifies the beginning of a long-lasting relationship for the two communities that can only grow and expand” quoted Mr. Papastylianou.